For as long as man has sought to use the Earth to feed, shelter, clothe, and arm him, we have known about herbal remedies. This is not untrue for beauty regimens and skin care. Yet, when scientific breakthroughs were starting to save lives, alternative beauty cures were being disseminated. Ironically, in the age of Google and smart-anything, more and more crazy claims are being pushed out by companies that hold consumer trust. More than fradulent beauty claims, we don't see the damage that investment in these companies is contributing to corruption, damaging to the Earth, and raising national poverty levels until it is too late. It's a vicious guilt cycle that inevitably leads to people putting trust in others who haven't proven anything except that they can buy ads and influence. To our benefit, though, the US Government actively enforces laws put in place to protect consumers, as well as providing access to free information about how to locate possible misleading statements in branding. But the information age is full of misinformation, so we must be diligent in our pursuit of knowledge to find the truth about what we're putting on our faces. "Often sold on the back pages of newspapers, these tonics promised to cure a wide variety of ailments including chronic pain, headaches, "female complaints" and kidney trouble. 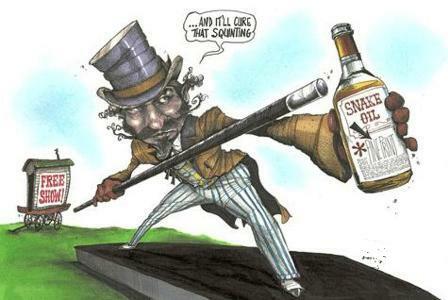 In time, all of these false "cures" began to be referred to as snake oil." Like many other concepts in our society, the term still carries weight but only as the exact opposite of it's original meaning. In today's society, modern 'snake oil' cures are in the form of alternative medical therapies and revolutionary beauty treatments. Just like the barker at the bazaars, these products are bold in their claims, outfitted to appeal to customers, and actually containing little to none of the benefits advertised. For example, Neutrogena's "Light Therapy Mask" uses LED light to get rid of blemishes on the face. It's providing an economical product based on a dermatological treatment, so that's a plus. I'm sure anyone would be happy with it until you find out it makes you look like a storm trooper experimenting with their light saber. 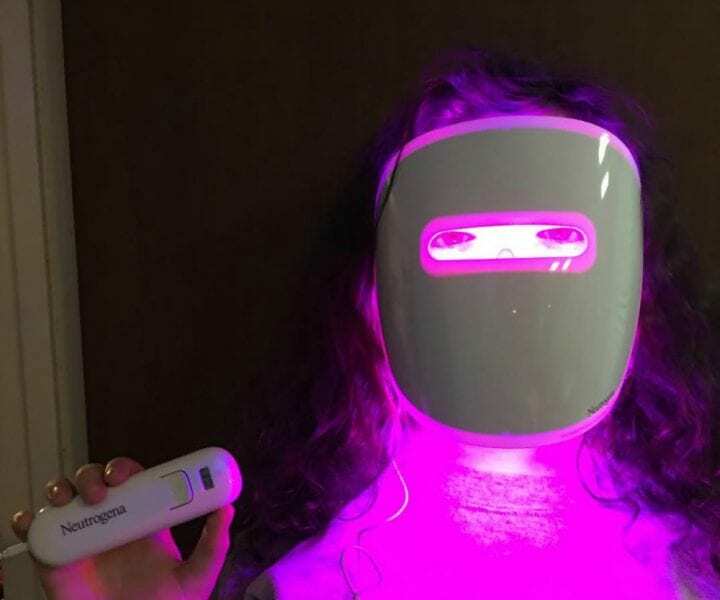 According to multiple product reviews, the "Light Therapy Mask" is faulty, expensive to maintain, and can even worsen acne symptoms. Also, claims in marketing have been leading to dissatisfaction with customers. Almost every product being advertised uses claims like pH balanced, even though all products are pH balanced to match the part of the body it is being used for. Tricky wordplay can be seen in claims like "helps with (insert skin problem)," "proven," or "patented formula." These words sound scientific, but only mean that the company holds a patent, the product can help with a vague solution, or it just exists. More damaging misdirection is seen in claims like "hypoallergenic" or "chemical free." Not only is this claim wrong, it can lead to dangerous side effects for people with skin allergies or sensitivities. "Every cosmetic or personal care product you would buy is made of chemicals.... Hypoallergenic products are not safer or more gentle even though this is what the claim is meant to imply." Dermotolgists looking at skincare products have shown through their research that many products marketed to customers are just expensive bottles of facial moisturizer. This issue may seem only skin deep to many, but it can hit a sore spot for others. Chronic skin conditions like acne, exzcema, and rosacea already isolate many people. If someone sees a product that can help to clear up their problem, they may put an inordinate amount of faith in that bottle or jar. For someone that may be suffering with mental health problems, this could worsen their symptoms. According to the American Psychological Association, "Having a skin problem can prompt intense distress. In a 2014 National Rosacea Society survey of 1,675 patients with rosacea — a condition that causes facial redness and related symptoms — 90 percent of respondents reported lowered self-esteem and self-confidence, 54 percent reported anxiety and helplessness, and 43 percent reported depression." They further explain the issue, stating, "In a vicious circle, stress, depression and other kinds of psychological problems can exacerbate the skin problems." The manipulation of facts and marketing of a product as the hero of the story locks people in a box and tells them there's no way out except for their product. One silver lining in this tale seems to be our government regulators. The FTC has won suits against multiple beauty companies for false claims. 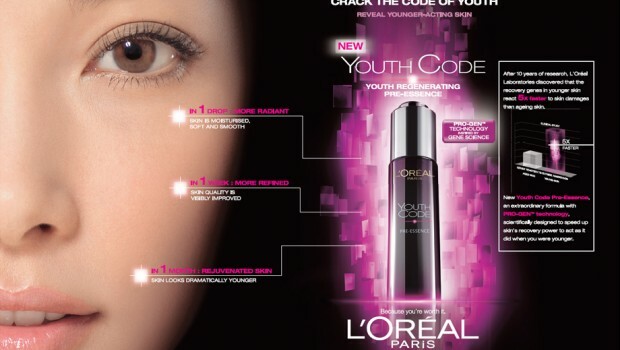 In 2014, the cosmetics brand L'Oreal settled a suit filed by the FTC concerning their Génifique and Youth Code line of products. "According to the FTC's complaint, L’Oréal made false and unsubstantiated claims that its Génifique and Youth Code products provided anti-aging benefits by targeting users’ genes." The FTC also provides consumer protection information for free, updating people on violations by companies. The Commission advises that if a product "promises easy weight loss, an effortless increase in muscle mass, or other 'too-good-to-be-true' benefits; or touts itself as an 'anti-aging' shortcut to health and vitality, exercise doubt, and check it out with your health care provider." It's my hope that this article can remind people that these false claims still persist, even in the age of the internet. People will still believe what a company puts on a label, regardless of its context or the actual meaning. Marketing that is deceptive can warp the mind, and that is our greatest weapon against corruption. Exaggerated cures and tricks of the eye are nothing new, so it is up to us as consumers to stay vigilant in where our money goes. Since the US dollar is so dear to both the consumer and the seller, we as fighters for truth in advertising must hold corporate powers responsible. Skin care was meant to help boost people's sense of self worth, not hinge their hopes on dubious placebo serums, miracle tonics, or snake oil cure-alls.